Author and customer evangelist Jackie Huba brought her "Citizen Marketers - When People are the Message" tour to Digitas Boston today. I was fortunate to get a seat to witness her fantastic presentation. The book, co-written by Ben McConnell, is a startling and interesting read about our new social media world with some recommendations on how to process all of the changes. Jackie beautifully illustrated the book's concepts with an excellent multimedia presentation and she gamely braved the after-show questions with honest answers and a book signing. 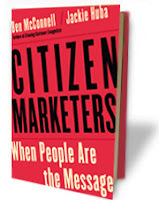 I can highly recommend the book - you do not have to be in advertising to appreciate the ever-changing ways in which we communicate, and how citizen marketers are cutting out the middleman. You can read my blurb on The Digital Hive here.